Share the message of HOPE! Isaiah 61:11 (NLT) The Sovereign LORD will show his justice to the nations of the world. Everyone will praise him! His righteousness will be like a garden in early spring, with plants springing up everywhere. Orders will ship within 10 business days of this fundraiser ending on 07/08. A group of 12 individuals involved in Christian Campus Fellowship at Missouri University of Science and Technology will be taking a trip to Cambodia January 4th to January 15th of 2018. While the group is there, we will be partnering with Christ in Youth (CIY) and Rapha House as we do various activities. We will be going to Rapha House locations where the organization helps with the restoration process for girls that are victims of human trafficking. We will be working with the Kids Club that provides a "vacation bible school" atmosphere for children in underdeveloped communities. We will also be experiencing the culture through new foods, historical locations, and interactions with the Cambodia people. Each member of the team is excited grow closer as a team and also grow closer to the Lord. 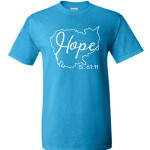 We appreciate your support in this t-shirt fundraiser! Morgan is an awesome lady and Cambodia will be blessed by having her there. If i could be there doing the work with you, i would so love to. But i dont think I will get the honor, nor do i think that I'd have the funds. I love God, and would serve him however he pleases. 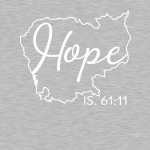 This campaign of hope for the victims of human trafficking is most definitely bring backed by him. Good luck. This is such a worthwhile mission. Glad to be able to support it. Our daughter, Courtney, is part of the group.